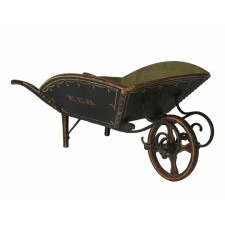 Dimensions (inches): 36" x 15.5" x 20"
Toy / child's wheel barrow of exceptional quality in both craftsmanship and paint decoration. 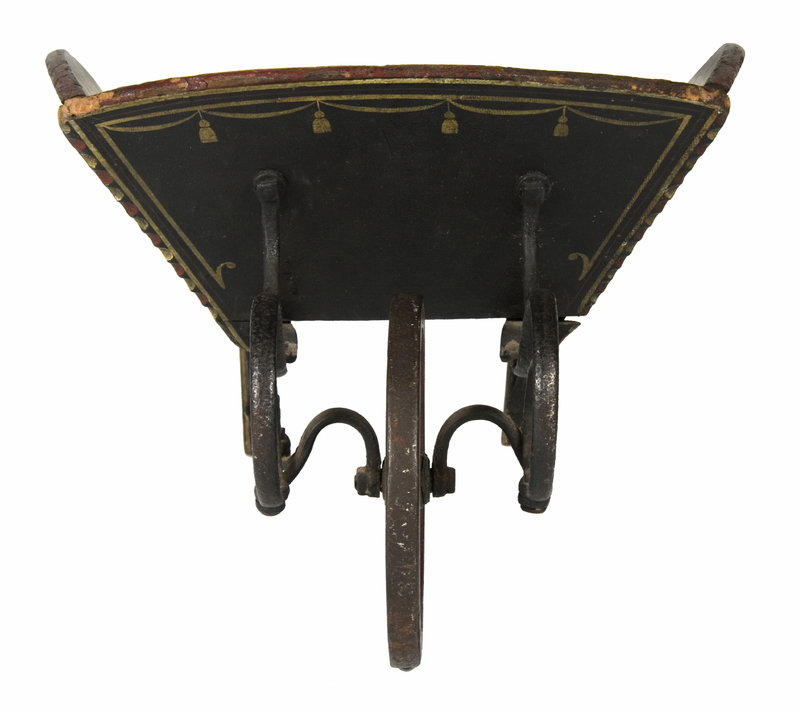 Found in Maine and dating to the period between roughly 1870 and 1890, careful attention was given to every detail. All four panels are gracefully arched. 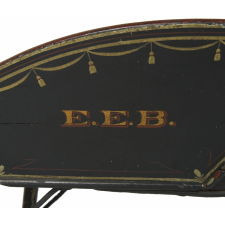 Painted black, the outer edges of the front and back are chip carved with the recesses alternately painted in red and white. Each is trimmed with red and yellow with carriage striping and related adornment that includes a swag and tassel border. In the center, on the left and right, are the designated child's initials. These appear in Roman characters, painted gold with red shadowing. 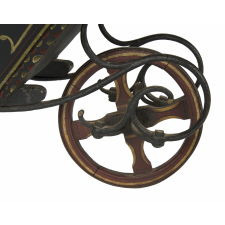 The legs and handles are painted to match with lambs-tongued corners and striping. 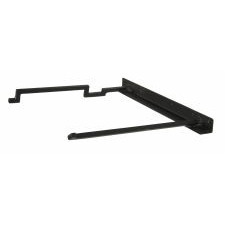 The latter are gracefully arched and the former are supported with blacksmith-made iron brackets. 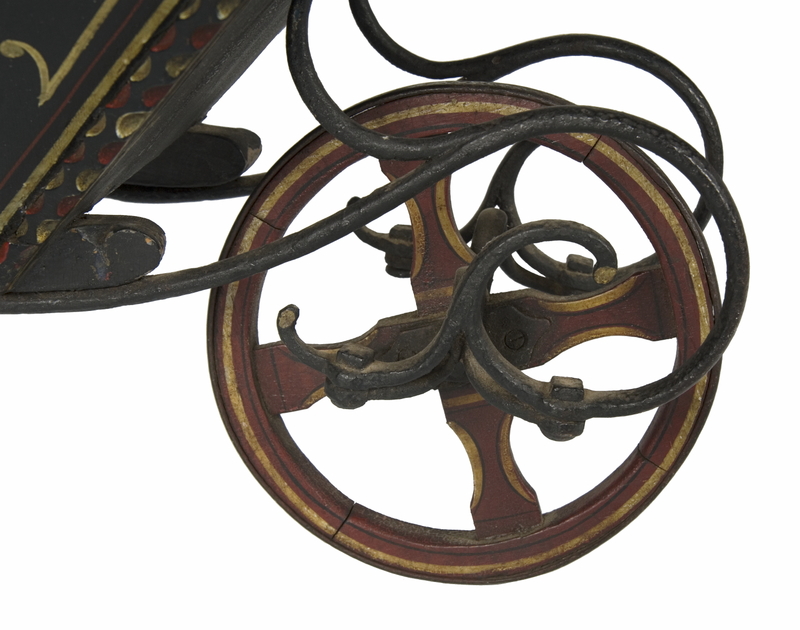 The wheel, with hourglass shaped spokes, is painted red and yellow and fitted with an iron tire. 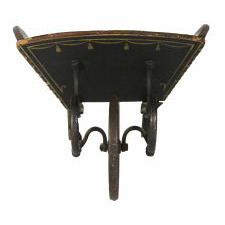 The ironwork the supports it is blacksmith-forged and elaborate with graceful scrollwork. 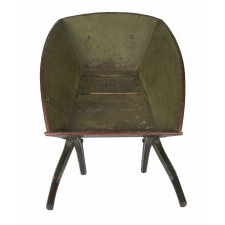 The interior of the box is painted olive green. 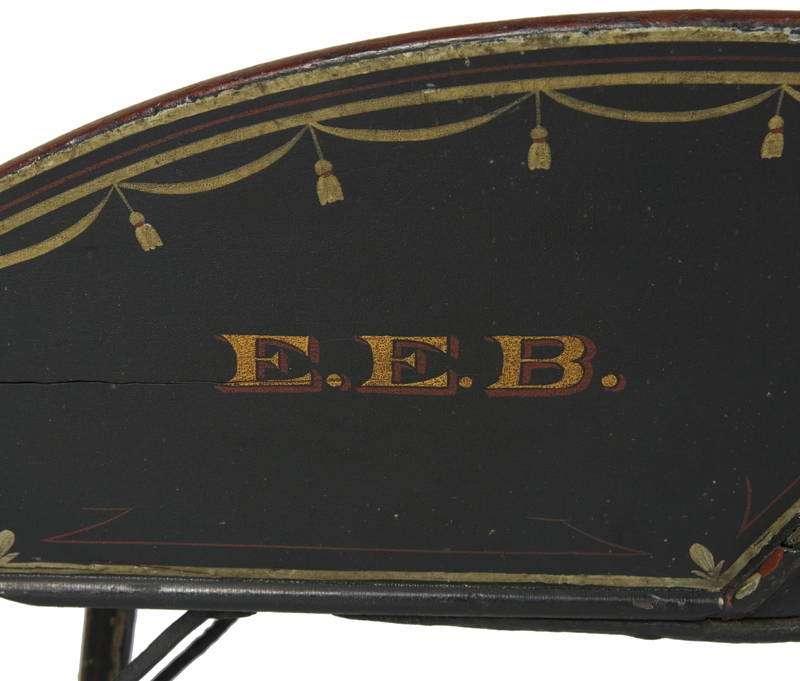 This is probably the work of the Paris Hill Manufacturing Company of Paris Hill, Maine, which is best-known for its painted sleds. 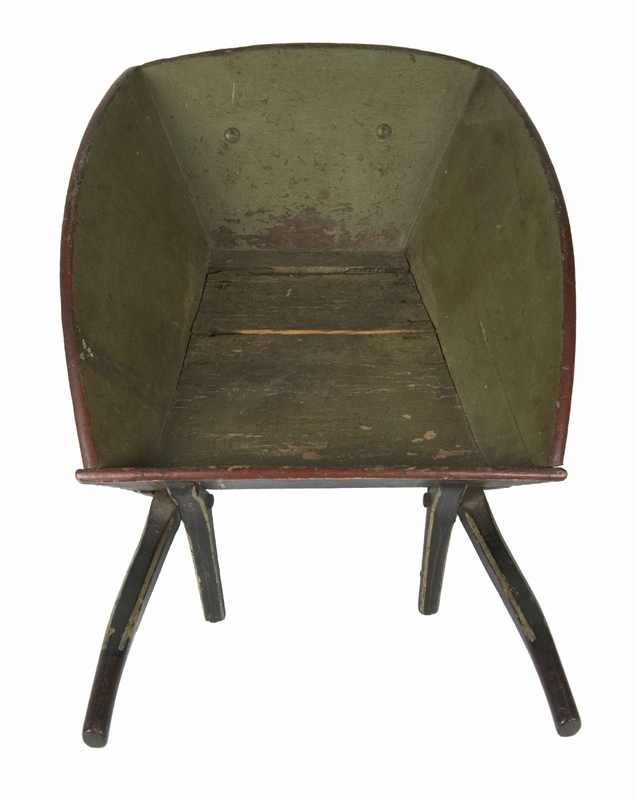 Because sled-making was a seasonal business, other avenues needed to be pursued to create income during the rest of the year. 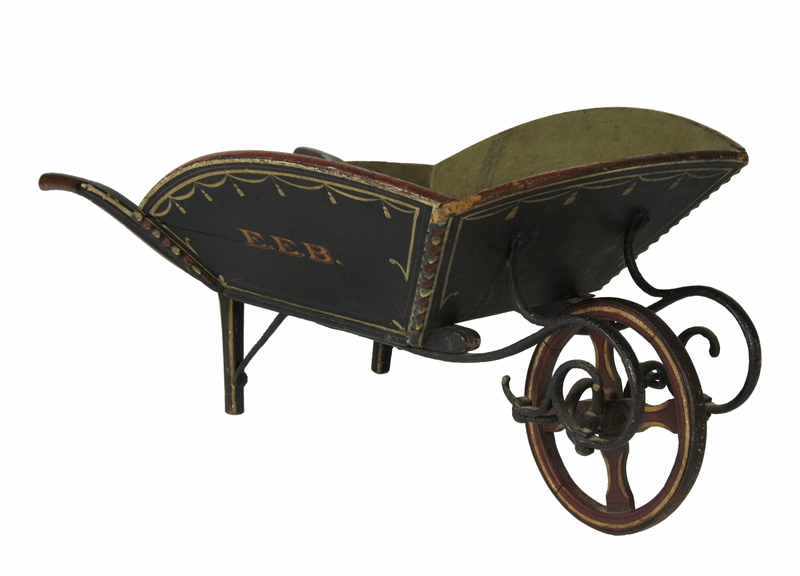 As master carpenters and painters, many sled-makers turned to the manufacture of furniture and other wooden objects for homes and schools in the warmer months, as well as the more obvious work of producing carriages and wagons. 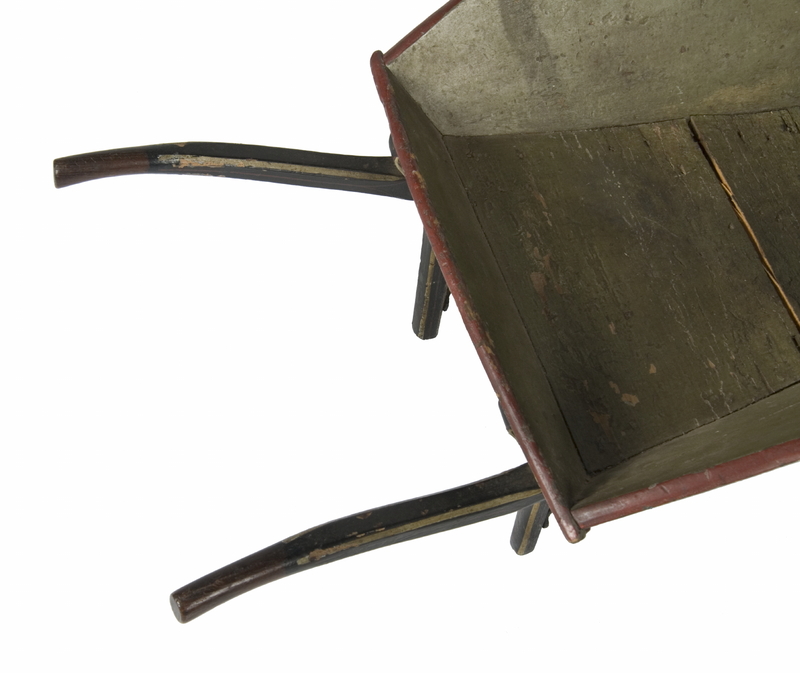 The decoration on this wheelbarrow is typical of that found on sled, carriages, wagons, and the like. 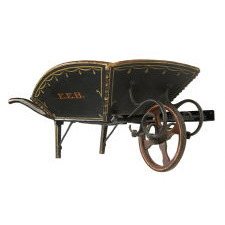 The Paris Manufacturing Company had modest beginnings. 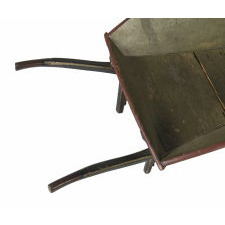 In 1861 a man named Henry Franklin Morton, starting with a hobby, began what would become the largest and longest operating sled company in American history… Living in West Sumner, Maine with his wife Lucilla…he started making rakes and non-steerable sleds as a hobby to make extra money. 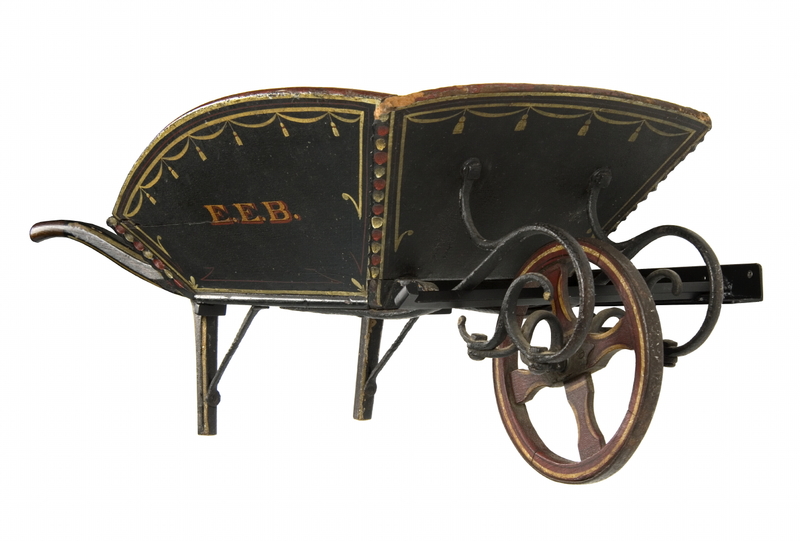 He assembled fifty sleds that his wife Lucilla hand painted in the family kitchen and they were successful in selling them. The following year, Mr. Morton formed a stock company and hired four employees…he was [later] invited to move his company to Paris Hill where he set up production under the name of Paris Hill Manufacturing Company. 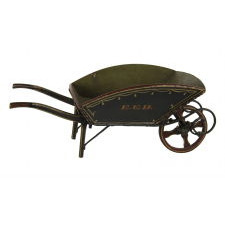 As business grew, so did the line of products. 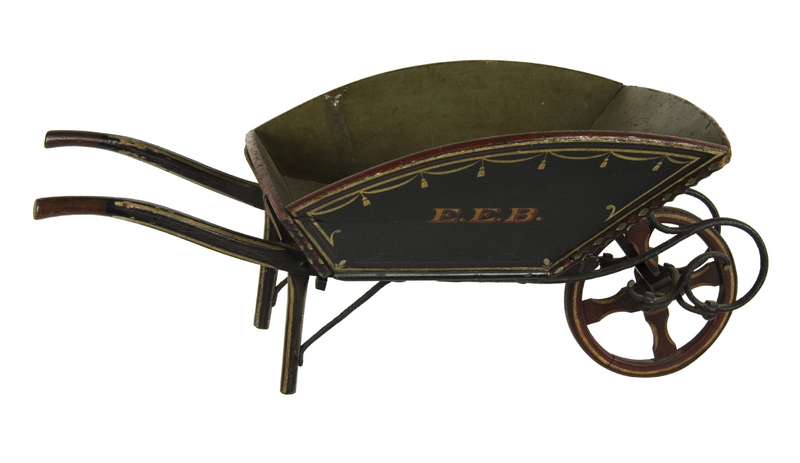 Go-carts, wagons, wheelbarrows, step ladders, ironing boards, children’s desks, furniture and more were added to keep the factory running all year long. Morton eventually relocated to South Paris in order to be closer to the rail system and the word "Hill" was removed from the name at that time.